Purrfect Pets is an online video slot game released by casino software provider Realtime Gaming (RTG) in May 2017. The 5-reel 25-payline video slot game is themed on pets, or more precisely kittens and puppies, which will be your real friends throughout the game. The video slot game is feature-rich providing you with even 3 bonus games along with Wild multipliers and even 2 random progressive jackpots. Not only that you can take advantage of multiple winning chances during which you can hit up to 30,000 coins in a single spin, but you will also enjoy cute and colourful graphics and entertaining sounds taking you to a lively garden where your new friends are waiting for you. The online slot game uses 5 reels and 25 adjustable paying lines allowing you to control the gameplay. Although spins played at fewer paylines will cost you less, by decreasing the number of active paying lines you will at the same time decrease your winning chances, so try to keep them all turned on. Betting options available allow you to wager from only R2.50 at all paying lines activated but you can place higher bets too which will provide you with higher payouts. 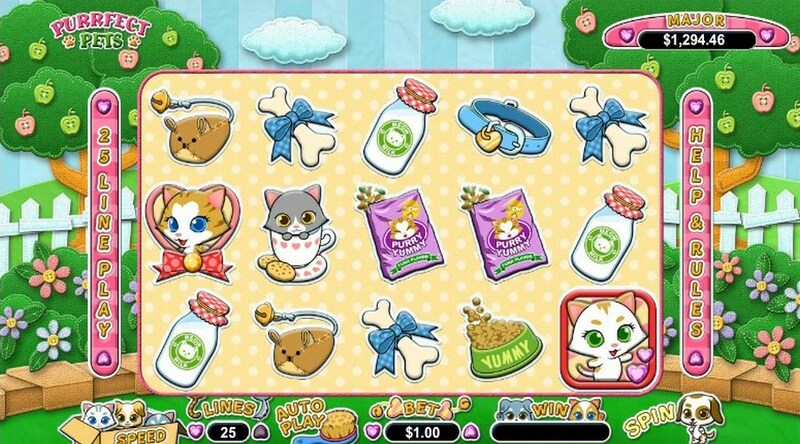 The reels are populated with kittens, puppies, bottles of milk, bowls and boxes with food, collars, toys and other items related to the theme of the game. Align at least three symbols of a kind on an active paying line consecutively left to right to win a prize. At the end of any spin you can hit a Major or Minor progressive jackpot randomly. 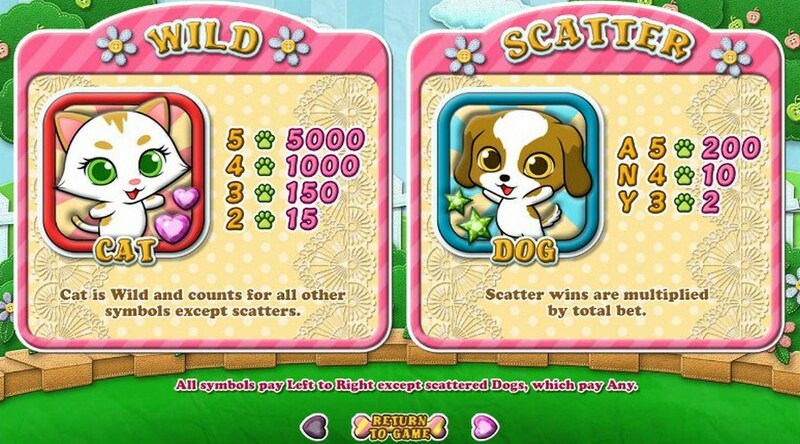 The Purrfect Pet slot machine game is a home to two special slots symbols, Wild and Scatter represented as the cat and dog respectively. Cat replaces all the symbols except for Scatters and if you land 3 or more Wilds anywhere on the reels you will trigger 10 free games with prizes tripled whenever one or more Cat Wilds complete a winning combination. When 3 or more Scatters appear on the reels, you get 10 Doggy Dollars free games with all prizes doubled. During the feature all Scatters act as additional Wilds. You can win 10 additional free games whenever 3 or more Dogs or Cats occur anywhere on the reels. Cats vs Dogs is a random feature triggered at the end of any spin that does not trigger the Doggy Dollars or Wild Cat Feature. You will be offered to pick one out of 3 icons to reveal either the Doggy Dollars, the Wild Cat or the Random Riches feature awarding up to 50 free games. All prizes during Random Riches free games are doubled but if a winning combination is competed with Wild, payouts will be multiplied by 6x. All Scatters act as extra Wilds and the feature can be retriggered. 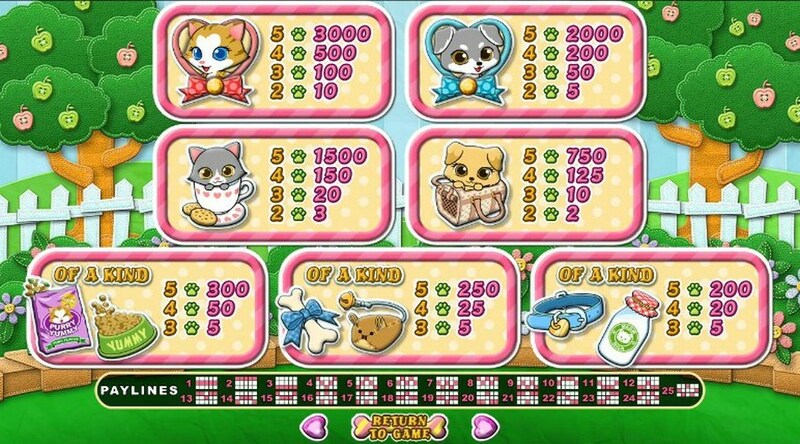 With three bonus games and multipliers going up to 6x, the slot Purrfect Pets is a perfect fit for those players who enjoy the gameplay loaded with excitement. Don't forget about two progressive jackpots which can make your day if you are lucky enough to hit them. The RTG online video slot can be played across all platforms, so you can benefit from its rewarding features and win up to 30,000 if you play it on the go too.